Buffalo is slowly saying goodbye to "The Aud." Officially known as the Buffalo Memorial Auditorium, the old building will be finally demolished in October, but clean-up crews are spending the summer preparing for the final event at the facility that not only housed the NHL's Sabres, but for about three decades, was the home to the American Hockey League's Buffalo Bisons. The Bison franchise was very successful, and the NHL took notice. The Buffalo Majors of the American Hockey Association became Buffalo's first hockey team in 1930 and lasted three years. But Buffalo was a solid hockey city, and the NHL in the late 1960s began to look at the city as a place in which it could do business. The old and unused Aud in Buffalo is a remnant of President Franklin Delano Roosevelt's Works Project Act of the mid-1930s to help get America out of the Great Depression by creating projects which put people back in the labor force. The arena opened in October 1940, and with the building came a new hockey team when Lou Jacobs moved his AHL Syracuse team to Buffalo. During the next three decades some of hockey's best-known names -- coaches Eddie Shore, Fred Shero and Billy Reay -- led the Bisons. There is also a who's who list of players who played at "The Aud," including Toe Blake, Doug Harvey, Tom Johnson, Dickie Moore, Jacques Plante and Brad Park as minor leaguers. There is also a strange logo that pre-dates today's sophisticated marketing techniques. The old Bisons logo was a soda bottle cap with Buffalo scripted in the middle. The Bisons' owners, the Pastor Brothers, owned the Pepsi-Cola bottling plant in Buffalo. The AHL approved the logo. Early on, the AHL ruled against the owners of the Hershey hockey club when they suggested the team should be known as the Hershey Bars because Hershey bars were made in Hershey, Pa. The Bars became the Bears. The AHL saw no problems with the logo as it was not selling a product other than hockey. 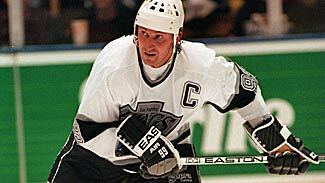 Is Gretzky's move from Racers fact or fiction? That era came to an end in 1970 when the NHL's expansion Sabres took to the ice in a renovated arena with a much larger capacity. Buffalo officials literally raised the roof for the new NHL franchise and an expansion NBA franchise, the Braves. The Sabres fared rather well in The Aud, although the team didn't win the Stanley Cup and closed the building in 1996. The Aud was more than a place to watch hockey and basketball. The Buffalo Stallions of the Major Soccer League, the Buffalo Stampede of Roller Hockey International, the Buffalo Bandits of the Major Indoor Lacrosse League and the Buffalo Blizzard of the National Professional Soccer League called The Aud home. But The Aud meant hockey to most people in western New York. Don Luce is going to miss the old building that hasn't been open in 12 years. Luce ended up in Buffalo in 1971 after the Sabres picked him up in a deal with Detroit and Luce became an integral part of the two-year old franchise. "It was a great building, the fans were almost a part of the team because they were so close to you. It was a smaller ice surface, it was just a great place to play," said Luce, who played in Buffalo for a decade. "The rink had electricity to it. It is tough to see it go." The Aud was unique. No air conditioning, the foghorn sound effect after a goal and it was the last NHL arena to not have a regulation-sized ice surface. "We had a lot of things that other arenas didn't have," said Luce. "But you know, it was a small building. The fans were right there and they were just part of the team. It was an old building. They had birds flying in there too." The most famous Aud stories are Jim Lorentz's killing of a bat that was hovering near the ice during a playoff game with Philadelphia. Luce was on the bench watching it all. Lorentz knocked down the bat during a break in the action. The bat was on the ice for a little while as no one wanted to go near it until the Flyers' Rick MacLeish picked it up and threw it out. "He was on a different line. It was a good swing, he picked it right out of the air," Luce said of Lorentz' act. Even though it has been 27 years since Luce last suited up for the Sabres and 12 years since the building shut down in favor of the new HSBC Arena, Luce has great memories of The Aud. Luce was a Buffalo assistant coach in 1986-87 and then was a member of the scouting department through 2006. "I thought we had some great teams there and all those guys, just playing there was awesome," Luce said. "It was very well built, it was a very solid building because when they raised the roof, most buildings you couldn't do that to, it was a well built building. "It's tough to see it go."